On February 24 news appeared in the Russian media about further plans for the modernization of the aircraft carrier Vikramaditya, also known as the Admiral Gorshkov. The ship is now undergoing upgrading at the Sevmash Shipbuilding Factory for the benefit of the Indian Navy, although the episode related to the transfer of the aircraft carrier has been dragging on for almost 15 years. The Gorshkov has earned itself the ‘glory’ of being the most difficult project in the history of military-technical cooperation between Russia and India. Work on its modernization has dragged on for way too long, and because of that rumors have surfaced that the ship could after all remain in Russia. 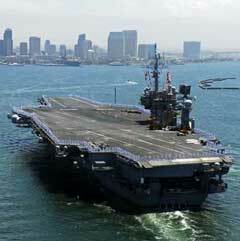 Yet $1 billion is needed for the modernization of the aircraft carrier for the Indian Navy. Admiral Gorshkov. Photo by rosprom.gov.ru. The story of the Gorshkov is somewhat similar to another story that received wide publicity last year: the story of the submarine Nerpa. The two ships are scheduled to be sold to India, but they have both been involved in incidents that cost people lives. True, if the incident on the submarine Nerpa, which occurred under strange circumstances on November 8, 2008, and took the lives of 20 military men and civilians, is still fresh on our memories, the case involving the Gorshkov has more or less been forgotten because of time. The tragic incident on the aircraft carrier, which back then was still in the Russian Navy, took place in February of 1994. Because of the rupture of the main vapor pipe, 7 sailors who had been locked up in one of the ship’s technical rooms died. The same month, because of a collision with a Ukrainian dry cargo ship, a fire broke out on the cruiser, and its consequences, according to some sources, made an eventual return of the ship into the combat group of the Russian Navy very unlikely. Nonetheless, on May 9, 1995, the Gorshkov led the V-Day parade in the Kola Bay after undergoing thorough repairs. It was in fact the last triumphant sortie of the ship out to sea. The Gorshkov in fact has not two, but even three names. Until October 4, 1990, the aircraft carrier was actually known as the Baku, a name that was changed to Admiral of the Soviet Navy Gorshkov, though even in official documents it was still being referred to simply as the Admiral Gorshkov. After an agreement with India, the ship was renamed as the Vikramaditya, which can be translated as All Powerful or Powerful as the Sun, after a legendary Indian leader who became famous not less through his many military victories. Construction of the aircraft carrier began at the Nikolaev shipyards under a design by the Nevsky Construction Bureau on December 26, 1978. It was based on further development of a series of cruisers of the Kiev-type built on a modified 1143.4 Project. In 1988, the Baku went to sea in its first combat mission in an squadron in the Mediterranean, and in December it was included in the Northern Fleet. Between 1989 and 1990, the ship also carried out combat missions and exercises in the Barents Sea. The ship had an air group made up of Yak-141 and Yak-38 vertical takeoff and landing jetfighters, as well as Ka-27, Ka-252RLD and Ka-252PS recon, search and rescue helicopters. But according to Ria Novosti, the vertical landing and takeoff jetfighters, which lacked the necessary combat characteristics, were what doomed the Admiral Gorshkov. The jetfighters performed few combat missions, had an insufficient range, and a high breakdown rate. The shortcomings could not be remedied because of the subsequent collapse of the Soviet Union and the dry up in funding. As a result, the aircraft were retired from combat duty and the Admiral Gorshkov itself was docked. Negotiations on the sale of the aircraft carrier to India began back in 1994 and had been going on practically for 10 years. Finally on January 20, 2004, an agreement was signed in Delhi between RosOboronExport, the Russian government’s arm sales agent, and the Indian Navy according to which India was to pay $1.5 billion for the warship. Approximately $600-700 million was to be spent on repairing the warship, as a result of which it was to be transformed from an aircraft cruiser into a light aircraft carrier. The bulk of the money was to be spent on planes for the ship: Mig-29ks jet fighters and Ka-27 and Ka-31 helicopters were being considered. In addition, the asking price included the ship’s equipment and armament, which was to be provided by third parties. The Vikramaditya in December 2008. Photo by Sevmash. The final configuration of the ship’s air group was decided upon relatively not long ago. It is to include 16 Mig-29ks, 4 Mig-29KUB, which India took delivery of in February 2009, and up to 8 Ka-28 helicopters and one Ka-31 and three Indian HAL Dhruv multipurpose helicopters. The frame of the aircraft carrier was also to be modified substantially to allow the basing of supersonic jetfighters with horizontal takeoff and landing; the landing strip was to be lengthened up to the nose of the ship, where there was to be a springboard at a 14 degrees angle. To slow down the jetfighters on the deck of the ship at landing, the aircraft carrier was to be equipped with three cable aero finishers. To raise jetfighters and helicopters from the hangar to the deck a lift with a capacity of 30 tonnes was to be added on the Gorshkov. The armament system of the ship also underwent modification, although the details remain sketchy. The aircraft carrier will thus be armed with a new air-defense system. In fact an Israeli antiaircraft system is being considered. In addition, the ship could also be armed with the supersonic cruise missile Brahmos developed in cooperation by Russia and India. Why has work to upgrade the ship dragged on for so long is now hard to tell. But it is obvious that there were reasons, and perhaps not only financial ones. The Indians also did not always observe the conditions of the contract, and funding, according to some sources, was neither always on time nor even made in full. According to Kommersant, a newspaper, India stopped making payments back in January 2007, and that same year, Moscow demanded $1.2 million from India for the completion of work. The Indian Finance Ministry rejected the army’s request for funds to pay the invoice from Russia. In addition, the newspaper affirms that India had refused to pay the $600 million necessary to begin tests in the Barents Sea in 2011. 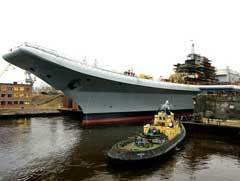 In late November 2008, information appeared in the Russian media that Russia had demanded another $2 billion from Indian to complete the modernization of the Gorshkov. Indian journalists, without particularly giving into the details of the problem, accused Russia of “arms-twisting,” since India was in dire need of the new aircraft carrier and a cancellation of the contract would have hurt the combat capability of its navy. Why has the price for the modernization shot up so radically? Nobody knows in reality, even though, as Itar-Tass insists, the transformation of an aircraft carrier cruiser into an aircraft carrier is comparable, from the point of view the amount of work hours, to the construction of a new ship of the same class. It cannot be ruled out either that inflation played a role here, as well as price increases for equipment and armaments. Even stranger are rumors that the U.S. is ready to give the aircraft carrier Kitty Hawk, which is scheduled for decommissioning by the U.S. Navy, to India free of charge. These rumors appeared in early 2008. According to Izvestia, a Russian newspaper, India, as compensation for the “gift,” was to purchase 65 F/A-18E/F jetfighters from the U.S. Such a deal would have in effect killed the Russian-Indian agreement on the sale of the Gorshkov. But the Indian Navy later denied the information. Kitty Hawk. Photo by US Navy. 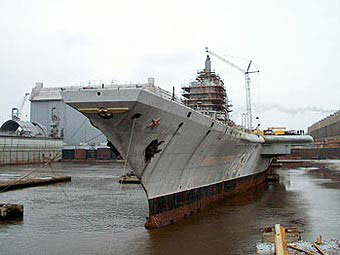 According to the latest information, which Izvestia reported on February 24, 2009, citing the United Shipbuilding Corporation, $1 billion will be needed to complete the modernization of the Gorshkov, and information that Russia has asked more than $2 billion additionally for these purposes has nothing to do with reality. The press service of Sevmash announced not long ago that a delegation of the company that visited India signed an agreement on the payment of the first tranche, and that even though India has not paid the money in the past two years, work has continued, and that the ship his half-ready. The final decision on the amount of additional payments will likely be made by May 2009. In the meantime, the sides will continue to negotiate an agreeable price for both. Another question in this saga around project overruns in the upgrading of the Gorshkov is why did the Russian side wait for so long before issuing a denial of the rumors that were circulating in the India media about the price of the deal? It cannot be ruled out that, in fact, the price was determined only recently in negotiations that were deliberately kept low key. That Delhi was ready to ditch the Gorshkov and begin a search for an alternative was, after all, hard to believe. The Vikramaditiya will replace the Vigraat in the Indian Navy, an old British Hermes light aircraft carrier built in 1959 and whose potential has been exhausted. The Kitty Hawk is in fact as old as the British Hermes and can only be considered seriously only as scrap metal. In addition, Indian has been increasing its defense budget despite the financial crisis, and relations between Delhi and its neighbor Pakistan are only worsening, even though it is hard to believe that the ship will indeed be transferred to India in 2012 as planned.